I'm going to skip ahead a little in my chronology (don't worry, I'll come back to the Christmas Cookies in the next post) and write about my post-Christmas trip to to Carlo's Bakery. 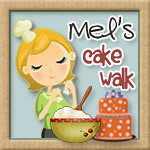 Now, I watch all the cake shows-- Cake Boss, Ace of Cakes, Ultimate Cake Off, Food Network Challenge cakes... But Cake Boss was my first love. And still my favorite. Why? Because Buddy provides actual insight into cake construction, often naming his materials or demonstrating his techniques. While you can garner a little bit of 'how to' from the other shows or discover new techniques, it's certainly not the focus. Now that Cake Boss is in its second season, it's a little more gimicky, but I'm still a big fan. Anyway, while I currently reside in Atlanta, my hometown is a little place called Florham Park, NJ. It is near Morristown, and only about 40 minutes from Hoboken, home of the now famous Carlo's Bakery. So when I went home for Christmas, I decided I'd make a run to Carlo's to sample some of the fare. I'd heard from multiple sources (for example, he's made cakes for my neighbors' bar mitzvahs) that Buddy's cakes tasted even better than they looked, so I wanted to see what the standard was. I had this crazy idea that I'd just walk in, grab a little cake, and walk out. Take a few pics. So I grabbed a few friends the Monday afternoon after Christmas, and we made the trek to Hoboken. Well, we arrived (around 4 PM), and we spotted the Bakery! And then we spotted the line... wrapping around the block.... We weren't expecting so many others to have the same idea! At around this point, they sent out Mauro to take some pictures! For the last half hour of waiting in line, my toes were numb, but I was so close I could smell it!! Finally, we were allowed inside. They have a doorman, just like a club, 1 in 1 out. :) And when you go in, they hand your group a number. The sign on the door, saying TLC owned our souls. I didn't see any cameras, though. The crowd inside the bakery was all astir! Someone asked, will you come out for a picture? Buddy replied, 'yes, just give me one second.' Well, true to his word, he came back out 5 minutes later, and took pictures and signed autographs. Me and the Cake Boss! This cute pink fondant bow cake! I'll admit, I didn't even know what flavor it was when I bought it. Didn't want to take too long for my transaction. I felt like the crumb was just perfect. And it was very moist. The chocolate fudge filling was really tasty, the white buttercream tasted pretty standard. I don't know what brand of fondant he uses, but it tasted pretty good too. It was actually my first time eating fondant-- having read some very vehement criticism of fondant, I wasn't sure what to expect. I think my only objection to it is that it's a chewy texture, but I certainly didn't feel that it made the cake less enjoyable. So moral of the story, Carlo's bakery is worth the trip. And the wait. I was REALLY LUCKY to meet Buddy. Thinking about it now, it was a Monday night, so that's probably a pretty slow time for custom cakes. I imagine there are plenty of times when he has to hide in the back and work. But at least you can have your cake and eat it too!